Gameplay seems to be a simple affair, as you take on an assortment of platforms, avoiding baddies and ultimately trying to reach the goal without dying horribly along the way. There is a bit more to it than that, though. Along the way, you have to keep yourself from getting too hungry to cope anymore, as shown by a meter at the bottom of the screen. There's a ludicrous amount of doughnuts scattered across the levels, enough to make Homer Simpson weep, and these keep the hunger in check, but the meter soon starts to deplete so it's a race against time to reach the end of the level. But, and this is a life lesson we should all learn, eat too much and our hero gets fat and needs to take (cover your ears children...) a poo. A number two. A dump. Whatever you call it, the basic fact is that too many doughnuts without visiting the toilets scattered about the levels and you become bloated, unable to continue and end up soiling yourself. And no, I'm not making this up - Hermes may be the only Dreamcast game that accurately simulates the daily trauma of having to visit the toilet to, erm, make more room for food. There's also bottles of a red liquid strategically placed around the stages which seem to power you up. These interesting additions to the basic platforming adds something to the gameplay, which otherwise would be run, jump, avoid certain death...repeat. While it may not be sophisticated to say so, it's all in good humour isn't it? Yeah, these types of games are common nowadays with the proliferation of smart phones and retro-themed platformers, but it does what it says it's going to do, is playable and enjoyable, and ultimately isn't that what we want? The stages themselves are varied, retro in style and are both designed well and look good. There's a bit of variety as you progress through the game's 32 stages, so it's always nice to get to the next stage to see what the artists have come up with. There's the inevitable sense of frustration when you descend to your death as you haven't timed your jump perfectly, or you end up walking into spikes on your last life and have to continue from the last checkpoint, but then those of us who grew up in the 80's and 90's are well versed in games hating you and making you want to throw controllers at the wall. The game has a continue option so you can always start back at the last checkpoint (with a reset score, natch), and generally the difficulty isn't too bad. Enemies vary as the stages progress, with an assortment of beasties who have probably heard that our hero likes to kill animals and eat them, and are understandably less than impressed by his violation of their territory. It all adds a little bit of variety to proceedings. 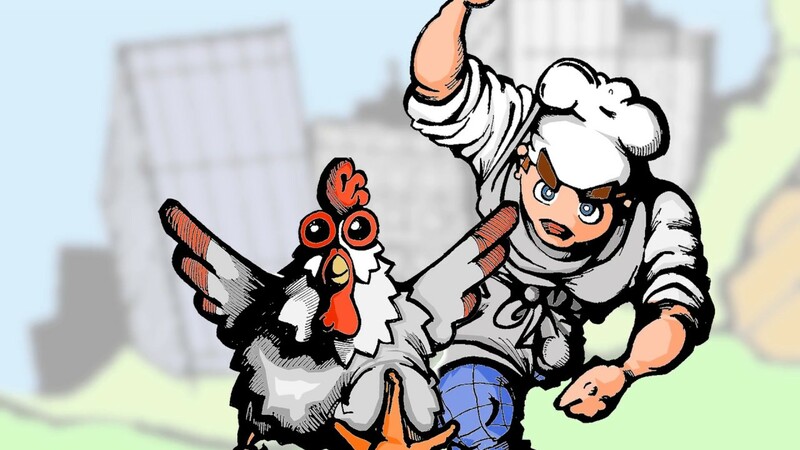 There's also a boss fight to end the game with, but I've not got that far yet (I think it's probably a fair bet that it will involve poultry or foul play). One of the stand out parts of the game however is without a doubt the soundtrack. Roland Voss (who did the Fruit'Y soundtrack) and Johan Letfors have created an array of Amiga-esque chiptunes that are excellent throughout. 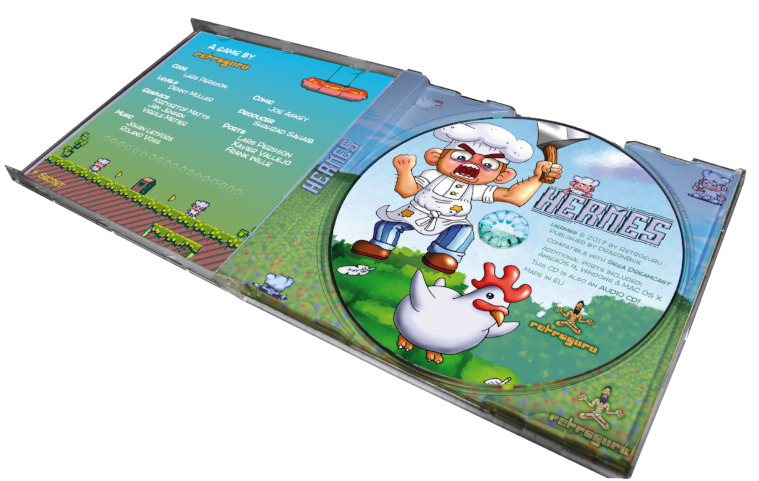 The CD, as well as doubling as a version for PCs, also acts as a proper audio CD, and I guarantee you will use it as such, because the melodies are blooming excellent. Invoking memories of early 90's gaming, they are fantastic examples of what chiptune music can be at it's best, and I have probably spent as much time in the game listening to them as actually playing. I could moan about the games utter lack of instructions, but a) that would be a bit harsh for such a simple game, after all we're not idiots and I'm sure most of us can work it out; and b) the comic book which came with the game pretty much explains the game's concept in one of the more awesome ways I've seen. It runs through what each element of the game does, and it's enjoyable to see such a different approach taken. For those wanting a brand new experience for the Dreamcast with some (literal) toilet humour, retro stylings and an awesome soundtrack, Hermes is, at 15 Euro (how much else can you buy for 15 Euro? Not a bloody lot here in the UK I can tell you that. Thanks Brexit!) a nice and cheap way to support the indie scene and have something else to play on your console. There will be those who think the game is crap - a cheap, mobile-like video game designed to rinse unsuspecting Dreamcast fans of their money. I say ignore the haters (cheap bastards), approach the game with expectations of a simple, fun platformer, and you probably won't be disappointed. Buy Hermes from Dragon Box Shop here, or find further information at the Retroguru website. 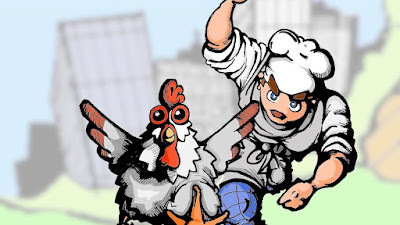 Disclaimer: If you're reading this and find the idea of running after a chicken (no, I don't know if he gets caught in the end, I'm crap at games...) to be in bad taste, are offended by the very idea, and are writing to PETA at this very moment to voice your disgust, I'll finish this off by saying that this review is probably going to be the only one done for this game by a Vegan who hasn't touched meat in 20 years - and, you know, it's only a game. I slaughtered half a species on Red Dead Redemption. Doesn't make me an apologist for the meat industry. The game doesn't come bundled with the severed head of a chicken (note: as a Dreamcast fanboy I probably would buy a limited edition complete with chickens head. Just saying), no birds were hurt during the making of the game and...well...don't be so easily offended? Haha , im sorry not paying more attension to who is writing. Great review Mike ! @Александр Поляков: We re-used lots of code from Sqrxz, but naturally our engine has developed further. @Mike Phelan: Thanks for the nice review :) Vedder did also work on the Fruit'Y sound track, just to be complete. @Tom Charnock: I hope your press copy will reach you soon.